Senior Care - Helping aging seniors safely manage and enjoy an active lifestyle while maintaining their independence. New Mothers and Working Parents - An extra hand around the house for new parents after the baby's birth. We also help working parents by staying home with sick or injured children in an emergency so parents won't miss work. 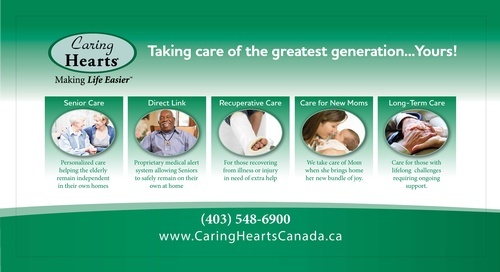 Recuperative Care - Helping to make client's recovery from illness or injury as quick and comfortable as possible. Continued Care - Making life easier and more enjoyable for individuals facing lifelong challenges by helping with everyday tasks. With Direct Link's exclusive line of Personal Emergency Response Systems, you can live independently and securely in the comfort of home longer than might otherwise be possible! 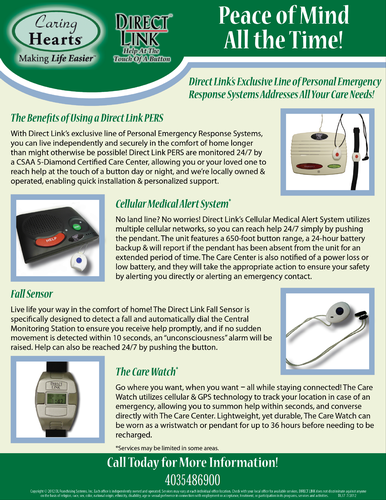 Direct Link PERS are monitored 24/7 by a CSAA 5-Diamond Certified Care Center, allowing you or your loved one to reach help at the touch of a button day or night, and we're locally owned and operated, enabling quick installation & personalized support.